A creeping perennial with trailing stems to 3 m long; stems densely covered with short and some longer spreading hairs,; stipules heart-shaped. 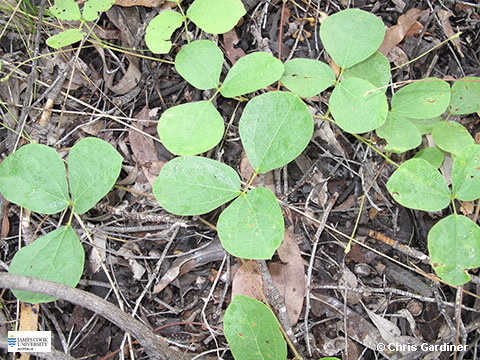 Leaves alternate widely separated along the stem, each with 3 leaflets; leaflets almost circular to 3-8 cm long, dotted with resin glands on both surfaces. Flowers pea-shaped in axillary racemes, corolla yellow, standard about 9 mm long, wings yellow, stamens 10, 9 fused and 1 free. Pod to 3 cm long, flattened densely covered with hairs and yellow glands; seeds 2-4 per pod.